This is a group of fish that can get very large, anywhere from 4 inches to more than 2 feet, and will eat small fish, crab, shrimp, and any invertebrates they can grab. Though some people have kept a couple of these fish in reef tanks because of their size and what they eat, they’re better off in a large FO or FOWLR tank. Unlike a lot of the other wrasses, different types of hogfish can be mixed together in the same tank but you need to make sure the tank is large, has rocks for hiding spaces, and the size of each hogfish should be different. They won’t fight with each other but will develop a pecking order and usually stay out of each other’s way. Wrasse and hogfish usually grow slowly so the size that you purchase them at will usually be the size they’ll stay for some time. 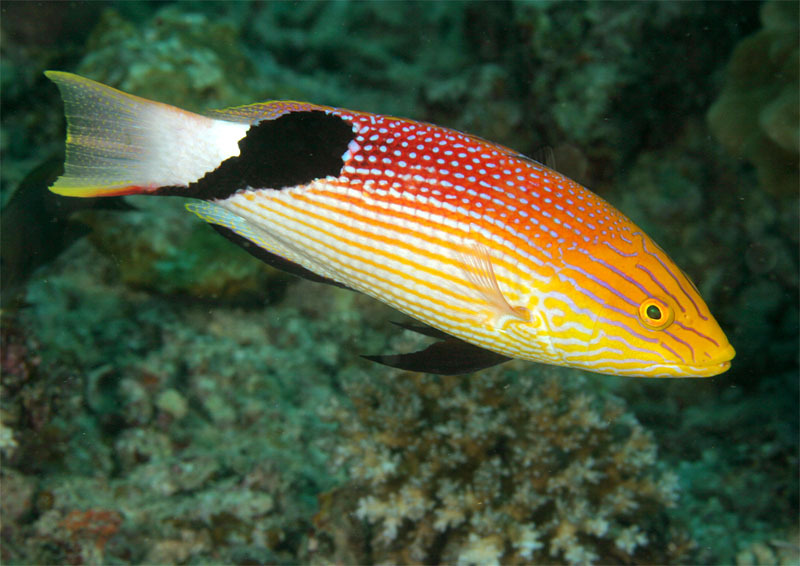 Hogfish can be kept with aggressive fish but triggers, eels, and other very aggressive fish may harass it and take pieces out of its tail or fins. This could cause the hogfish to hide or be really stressed out and even die, so you need to be careful when mixing these fish together with other fish, even though they are large in size. They need hiding spaces and caves in the tank as they can be on the shy side. This is a group of hogfish that are regularly available for sale at most LFS. Most get up to at 1 foot in length though the Spanish Hogfish can get close to 2 feet, while the Saddleback hogs usually remain at a smaller size, about 4-6 inches. Small juveniles usually have different markings but within a short time they change over to the adult colors. Small juveniles will also perform cleaning functions. This is a very hardy group of fish that does very well in FO or FOWLR tanks, though if you’re not going to have invertebrates, they would also do well in a reef tank.